This article is about the character in Super Smash Bros. for Nintendo 3DS / Wii U. For other uses of "Trainer", see Trainer. Steps off of a Wii Balance Board. The Wii Fit Trainer is the exercise coach appearing in the Wii Fit line of games, who guides players through the games' routines and poses. They have made crossover appearances with the Mario franchise in the Super Smash Bros. series. Wii Fit Trainer is one of the new playable fighters in Super Smash Bros. for Nintendo 3DS and Super Smash Bros. for Wii U. Like in the series of origin, Wii Fit Trainer has male variants available as alternate costumes in addition to the default female trainer. Along with the Pokémon, Sonic, and Shadow, the Wii Fit Trainer has a different voice actor in different regions (e.g. a French voice in the French version, and a British voice in the UK and Australian versions). 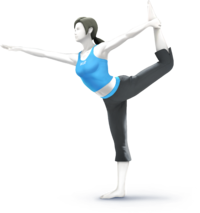 All of Wii Fit Trainer's attacks are based upon various yoga and exercise poses as seen in the Wii Fit series, as well as aerobic and balance activities seen in Wii Fit. Their standard special move is Sun Salutation, which fires a ball of light at opponents. Their side special is Header, in which they headbutt a soccer ball. Their up special move is Super Hoop, which sends them into the air as they spin around with several hula hoops. Their down special move is Deep Breathing, which when timed correctly recovers damage and powers up the trainer's attacks. 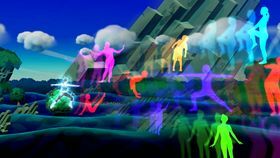 Their Final Smash, Wii Fit, sends a barrage of multi-colored exercise images in front of them, damaging opponents. The female and male Wii Fit Trainers return as unlockable veteran fighters in Super Smash Bros. Ultimate, where their faces have been slightly redesigned. According to director Masahiro Sakurai, this redesign was requested by the Wii Fit developers. Wii Fit Trainer has received many improvements to their moves, such as: increased mobility, reduced short hop timing, decreased landing lag in their aerial attacks, the reintroduction of directional air dodges, and the abilities to use any ground attack out of a run, and using aerial attacks on ladders. Wii Fit Trainer also receives direct improvements to their overall damage output, as well as the ability to knock back opponents and the placements of their attacks. Wii Fit Trainer's Classic Mode route has her fighting with chubby competitors, as if she is getting them into shape like a true exercise coach. Sun Salutation is the Wii Fit Trainer's standard special move, based upon the yoga poses of the same name as seen in Wii Fit. When used, the trainer charges up a ball of energy; like other moves of this type the charge can be stopped by dodging and restarted again afterward, and can be fired while charging by pressing the special attack button again. The charge also automatically cancels once the move reaches full charge. When the move is fired at full charge it restores 1% damage. In Super Smash Bros. for Nintendo 3DS and Super Smash Bros. for Wii U, this move also has two customizable variants. The first is Enriched Sun Salutation (Concentrated Sun Salutation in the PAL version), which makes the energy ball smaller but more powerful as it charges, and it does not heal when thrown. The second is Sweeping Sun Salutation, which moves more slowly and again does not heal, but pushes opponents back when it hits, dealing multiple hits to them. Header (named Heading in PAL regions) is the Wii Fit Trainer's side special move. When used, the trainer jumps, pulls out a soccer ball, and hits it with their head to attack. The ball disappears after bouncing once, or after hitting an opponent. The player can hit the ball early by pressing the special attack button while she is heading the ball, which changes the angle of the arc in which the ball moves. The headbutt part of the attack also deals a meteor smash if it hits opponents. 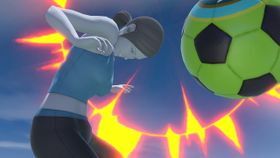 The move can be canceled by pressing the shield or grab button before the headbutt, which causes the Wii Fit Trainer to be helpless afterward; the soccer ball also falls to the ground, and can be used like the normal soccer ball item, though with less power. This move is given two customizable special attack variants in Super Smash Bros. for Nintendo 3DS and Super Smash Bros. for Wii U. The first is Huge Header (Over-Pumped Football in the PAL version), which hits a larger soccer ball that moves more slowly, at a higher ark, and deals less damage; the headbutt, however, deals more damage, and the ball stays active longer. The second variant is Weighted Header (Weighted Football in the PAL version), which hits a soccer ball that is heavier but faster and deals more damage; the soccer ball also does not last as long. Super Hoop is the Wii Fit Trainer's up special move. 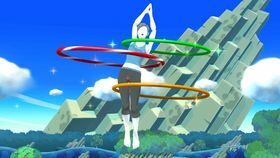 The Wii Fit Trainer spins three hula hoops around themself, rising into the air. By repeatedly pressing the special move button, the player can rise higher into the air and move more quickly. The hula hoops can also damage opponents nearby. In Super Smash Bros. for Nintendo 3DS and Super Smash Bros. for Wii U, the first custom variant for this move, Jumbo Hoop, gives larger hoops that deal more damage but cannot move as high, while the second variant, Hoop Hurricane, creates a gust that draws in opponents while the hoops knock them up, allowing for multiple hits. 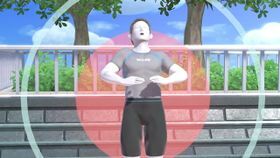 Deep Breathing is the Wii Fit Trainer's down special move. The trainer inhales, a red circle appearing around them and a blue ring getting closer; the player must press the special attack button when the two align, at which point the trainer recovers damage and the power of their attacks are increased; if the player fails then nothing happens. In addition, failing when using the move after receiving the power boost immediately removes it. If the move is used immediately after, the ring closes in more slowly, though it gets faster the longer the player waits after using the move. In Super Smash Bros. for Nintendo 3DS and Super Smash Bros. for Wii U, the first custom variant for this move is Volatile Breathing, which no longer heals or powers up, instead creating an explosion that damages nearby opponents, dealing more damage when closer to the trainer. The second is Steady Breathing, which is faster to execute and gives the Wii Fit Trainer super armor for the entire duration of the effect rather than attack power, but it takes longer for the move to fully recharge; the ring will move more slowly than usual when using it immediately after using it once. Wii Fit is the Wii Fit Trainer's Final Smash. When used, the trainer strikes a pose, sending out silhouettes of multiple colors and poses in the direction they are facing to strike opponents, pushing them back and spreading out farther as they travel entirely across the screen. In addition to the silhouettes, the trainer also damages opponents on startup. In Super Smash Bros. Ultimate, a giant silhouette is sent out at the end of the move. Wii Fit Trainer appears as a Mystery Mushroom costume in Super Mario Maker, unlocked by scanning her amiibo or randomly after completing 100 Mario Challenge on Normal difficulty or higher. She also appears in the Wii Balance Board's costume's pose. Wii Wii Fit Plus (10/2009) NA: The female trainer who helps you in the Wii Fit series. She favors a fighting style composed of yoga poses. This makes her a capable close-quarters fighter, but she has ranged attacks as well. She also has a move called Deep Breathing, which can heal you and increase attack power if timed right. PAL: You can choose one of two Trainers to help whip you into shape - or better yet, whip everyone else into shape! Use all sorts of yoga poses and exercises to get fit and flexible, and inflict serious damage on the other fighters in the process! Or try some deep-breathing drills to increase power and defence. It's all good! Wii Wii Fit Plus (10/2009) NA: The male trainer from the Wii Fit series, his neutral special Sun Salutation charges up a ball of light that, when launched, will heal him a bit. His Jackknife pose is excellent for toning the abdominal muscles, but in Smash Bros. the Wii Fit Trainer uses it as an air attack. Timed right, the attack can hit twice! 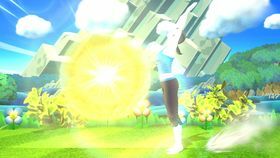 PAL: The Wii Fit Trainers' Sun Salutation move charges a ball of sunlight in front of you, which you can then fire forwards. When fully charged, it even heals you slightly! Jackknife exercises can help tone your abs, but they also work for air attacks in this game. Get close to a foe and, if you time it right, you can do a rep to hit them twice. Wii Wii Fit Plus (10/2009) NA: A simple yoga pose that is known to better your balance and posture, all it requires is standing on one leg and stretching your arms upward. Squatting low and then extending the arms will protect the Wii Fit Trainer from damage for a time and also increase the power of your yoga blows! PAL: Stand up straight on one leg with your arms above your head. This popular yoga pose works on balance and posture, and the Wii Fit Trainer uses it to great effect as an upward smash. Not only does it give temporary invincibility, but it also makes upward launching that much more powerful. Wii Wii Fit Plus (10/2009) NA: Stand on your right leg and extend your right hand, all while grabbing your raised left leg with your left hand. Arch your back like a bow to correct your posture. This is the Wii Fit Trainer's forward tilt attack, sending rear opponents flying upward and those in front flying forward. PAL: Work on your dancer pose by standing on your right leg and, while stretching your right arm forwards, taking your raised left foor in your left hand. Not only can this improve the alignment of your spine and straighten out a hunched back, but it can also help you launch opponents sideways. Wii Wii Fit Plus (10/2009) NA: The Wii Fit Trainer assumes a forward lunge, extending one arm forward and one back at shoulder level. This pose builds powerful thigh muscles and realigns the hips. With a devastating, strong forward smash, the Wii Fit Trainer can send opponents flying in both directions! PAL: To do the warrior pose, stand with your feet far apart, turn your left foot outwards, raise your arms, and then bend your left knee. Practising this stance energises your whole body and strengthens the thigh muscles, allowing for powerful side smash attacks that launch opponents in both directions at once. Wii Wii Fit Plus (10/2009) NA: A yoga pose where you lie supine on the floor, lifting your hips while keeping your shoulders and arms flat. This pose helps to strengthen your whole torso. The Wii Fit Trainer can perform this as a down tilt attack, using the knees to strike at opponents and send them flying. PAL: Lie on your back with your knees raised. Plant your hands and shoulders firmly on the floor, then lift your hips until your knees are over your ankles. This strengthens the entire torso, and you can also use it as a ground-based attack where you strike your opponent with your knees. (3DS) Wii Wii Fit Plus (10/2009) NA: First, kneel on your right knee while raising your right arm above your head. Then extend your left arm and leg out to the left and lean in that direction. This pose will strengthen the abdomen and tighten the waist. The Wii Fit Trainer strikes both above and forward with this move, but it takes a while to recover from. PAL: Rest on your right knee and raise your right arm as you stretch your left arm and leg out to the side. Then lean your body towards your left leg. The Wii Fit Trainer's dash attack demonstrates how to relax tense muscles, tighten your waist and strike your opponent - all at the same time. Wii Wii Fit Plus (10/2009) NA: Lie flat on your back and raise your arms and legs to form a V. This exercise is more challenging than a regular sit-up, but it's great for maintaining flexibility and working the abdominal muscles. The Wii Fit Trainer uses this pose to attack in the air, hitting opponents twice before launching them upward. Wii Wii Fit Plus (10/2009) NA: Starting from a crouched position, extend one leg back and the opposite arm forward, and hold. This is a strength exercise that firms up the abdominal and back muscles nicely. It's also the Wii Fit Trainer's down smash. Combine it with a lunge attack to send an opponent sailing sideways. PAL: Start on your hands and knees, then lift one arm and the opposite leg off the ground, and hold the position to train both your abdominal and back muscles. This exercise doubles up as one of the Wii Fit Trainer's down smashes, which can launch an immobilised opponent sideways. Wii Wii Fit Plus (10/2009) NA: In this aerobic exercise, you sway your hips to keep the hoops from hitting the ground. Multiple hoops ups the challenge! This exercise is a good workout and helps align the pelvis. The Wii Fit Trainer can recover well with this up special attack, but it doesn't do much to foes. PAL: This aerobic exercise from Wii Fit requires coordinated hip-movement to keep the hoop around your waist while two Mii characters throw extra hoops for you to catch mid-hula! It's also one of the Wii Fit Trainer's up special moves in this game. It's better at boosting jumps than it is at launching opponents off the screen. Wii U Wii Fit U (11/2013) NA: The Wii Fit Trainer has the most impressive balancing skills we ever seen! Many people probably started yoga to achieve this perfection. However, these abilities aren't developed overnight; it takes lots and lots of yoga practice. We won't judge if you'd rather take it easy—we aren't exactly writing this from the gym. PAL: There's just something about your Wii Fit trainer that you can't help but look up to. Maybe it's the soothing voice, the graceful motions...or just the complete physical superiority over the rest of us. Doesn't it make you want to break out a yoga mat? ...No? Well, we won't judge you. We're not sitting in a gym typing this, after all. N/A NA Wii Fit Trainer strikes the Warrior pose, sending an army of silhouettes flying forth in a variety of poses (21 in all!). This Final Smash's individual hits don't hurt much, but they add up and can even push foes off the edge. Meanwhile, Wii Fit Trainer is invincible! Unleash it at a height to get the full range of the cone effect. Viridi: She's a Wii Fit Trainer. She's an exercise coach...of sorts. I hope you're in shape, Pit! Pit: Well, I walk everywhere, so I'm probably fine. Viridi: Oh, of course! You're always at the beck and call of the goddess of light. Pit: Well, angels ARE messengers of the gods! Viridi: That's where you're mistaken, Pit. Angels are nothing more than divine interns. Palutena: In any case, be careful of her Sun Salutation move. It gets stronger with Deep Breathing. Palutena: He's a Wii Fit Trainer. He's an exercise coach... more or less. Pit, do you exercise regularly? Palutena: Is that because I work you too hard? Pit: Oh, no no no! Serving you gives my life meaning. I just...need to do a little cardio to keep up with your demands. Palutena: You're so sweet, Pit. Pit: And always at your service, Lady Palutena. Palutena: Watch out for his Sun Salutation move. It gets stronger with Deep Breathing. This female trainer helps you in the Wii Fit series, instructing you during fitness exercises. She often advises you to maintain your center-of-balance, helping you tone up and burn calories. Recently, she has also shown herself as a capable close-quarters fighter. ↑ Nintendo. (June 13, 2018). Nintendo Direct: E3 2018 YouTube. Retrieved June 13, 2018. This page was last edited on April 16, 2019, at 21:21.